Why do conservatives have such a hard time winning the economic debate in the court of public opinion? Simple, George Gilder says: Conservatives misunderstand economics almost as badly as liberals do. Republicans have been running on tax cut proposals since the era of Harding and Coolidge without seriously addressing the key problems of a global economy in decline. Enough is enough. 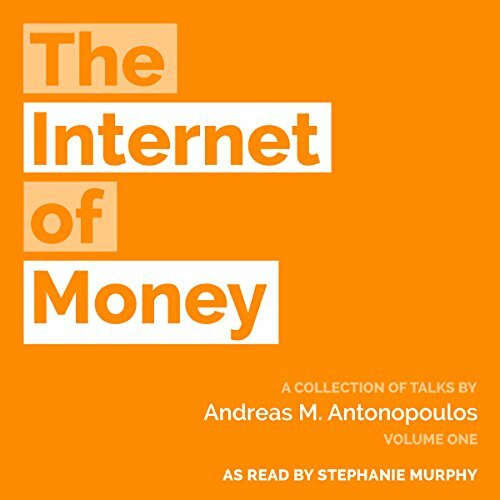 Andreas goes beyond exploring the technical functioning of the bitcoin network by illuminating bitcoin's philosophical, social, and historical implications. As the Internet has essentially transformed how people around the world interact and has permanently impacted our lives in ways we never could have imagined, bitcoin - the Internet of money - is fundamentally changing our approach to solving social, political, and economic problems through decentralized technology. 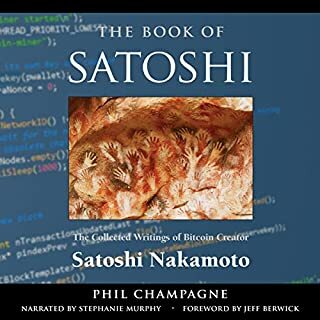 The book is a good rough introduction to Bitcoin without getting bogged down in details of exactly how transactions and blocks work. There is educated speculation about the possible future implications of peer-to-peer cryptocurrencies (such as Bitcoin). I would recommend this to someone who is curious but not necessarily familiar with information technology. 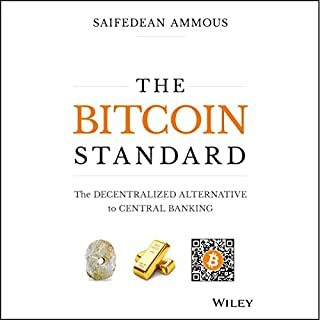 For those familiar with Bitcoin already this book is a nice refresher and reminder about what the protocol is capable of and what it's future political implications may be. The book was very disappointing because it was not technical at all. Also, he kept using way too many examples to over-explain easy concepts. Hearing the word Bitcoin over and over again also tends to get annoying. All of the useful info in here could have been condensed to a 30 minute video, instead of a 5 hour audiobook. Andreas Antonopoulos has a gift of explaining complex topics in a way that everyone can easily understand and expand upon. Cryptocurrency is going to be one of the most fundamental technologies of our entire society and it's worth finding out why. When I listened to this there were a few times where a sentence immediately repeated itself in the audio which was annoying but didn't distract too much from the experience. This was an amazing book that really clarifies. There's a lot of confusion around bit Queen as its completely different paradigm of interaction. This book lays out the fundamentals in contacts with what's going on today. A must read, timeless. I don't know how many times I hit replay so I could hear again what he just said. The book is riveting and very difficult to understand. It turns out that what I thought Bitcoin was, isn't. When I accepted that we aren't talking about a coin; that I don't have a wallet but a keychain; that's when I began to see the sheer brilliance of it all. If you're going to read any book this year, this is the book. 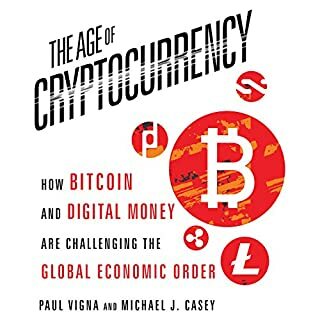 If you don't understand the concept of a blockchain and or cryptocurrency, this is the first book you should read. 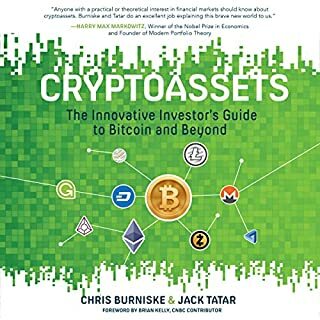 And, if you have a friend who doesn't understand the concept of cryptocurrency, forward this book to your friend for Christmas. Repetition is bad enough but having to pay for listening to repetition makes it worse. This also happens to be the first book where I got the hear the chapter and para-numbers being narrated as “Chapter two-dot-four-dot-three”. The theme is fine and the message that the crypto-currencies are the future with a huge potential could well be conveyed in less than an hour. This book needs thorough re-editing. What's the lazy way to create a book? Take recordings of various largely impromptu talks you give and slap them together into a disjointed mishmash. Some interesting ideas, but seriously, put in the effort to make an actual cohesive book. Have you wanted to learn about bitcoin, Blockchain and distributed ledge technologies? Andreas does a good job to explain concepts through analogy to give you a good foundation to be in the know in this revolutionary technology. Great book! Super informative and opens your eyes to the future, of everything!!! Well worth it!! An awesome book with mind opening things. 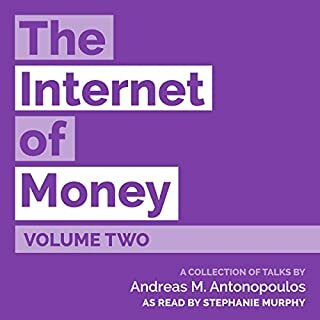 A must read/listen not only for the blockchain enthusiasts, but for all the people who want to understand the future that blockchain will definitely be influencing. The content of this book is amazing. We are already seeing that much of it is correct and the signs for the long term use cases look promising. Bitcoin is a technology. Very insightful introduction to Bitcoin! The way Andreas explains bitcoins potential and future use cases by referencing past revultionary technologies is refreshing. A great way to hear about bitcoin's properties and capacities at a macro level. Some of the talks I had already watched on YouTube, and obviously we can't grasp Andreas' stage magic through an audiobook, but it's a great way to convey the message in a structured way. Definitely worth a read !!! Quality book !!! AAntonopoulos thanks for taking your time and creating a masterpiece !!! My take on this book is that the author is very insightful and very forward thinking. Bitcoin is a very good start however the blockchain is revolutionary. loved the book and the it explaines the most complez issues in a very simple and understandable way. There is before and after reading this book. The historical account of tech development has completely changed my outlook. Anyone interested in the future should read this book. Fantastic resource for the less technically inclined in order to learn and understand Bitcoin and its potential. Andreas has been producing amazing educational resources about bitcoin for years. He’s well respected and has an incredible ability to explain a complex invention like bitcoin in a way you can relate to and understand. Thank you, Andreas and others who got involved in creating this book. I enjoyed listening to it, learn few things and got inspiration out of it. I highly recommend this book. 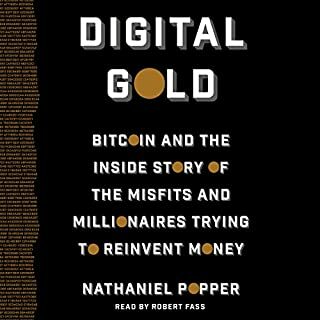 The most interesting book I've read on bitcoin and blockchain, of many. Antonopoulos' words include many original, highly thought provoking concepts, metaphors and analogies. A brilliant person, clearly. best anti fud book ever! i loved it. I really loved how the historical comparisons shed a light on the psychology of the hurdles of adoptions. it definately makes me look at all mainstream criticism with a new light in this arena. Loved it... I really like how he uses historical events to show how we as a society have so much resistance to change and the unknown. loved it. if you have any doubts about bitcoin this will set everything right for you. highly recommended. Finished listening to the entire audio in 2 sittings. Good. Had I heard this audio 4 years ago I would have bought bough Bitcoin much earlier at a lower price.